Some weddings are just FUN, and Tasha and CJ had one of the funnest! A little background info on this couple: Remember Hatley and Charles from this gorgeous fall 2016 wedding? Tasha and CJ are some of their besties! Our favorite thing ever is when Barn Couples recommend us to their friends, who then get married at The Barn and invite our past couples to their own wedding! We love hanging out with our new couples and our past couples at the same time... #winning! This wedding was full of the prettiest purple details, a beautiful brooch bouquet, one of the coolest cakes we've ever seen, and so many other fun things. It was all captured by Portraits by Melanie, whose beautiful work we always adore! Tasha and CJ were married at The Barn at Twin Oaks Ranch on October 7, 2017. Their color palette was a fun combination of shades of purple, green and blue. 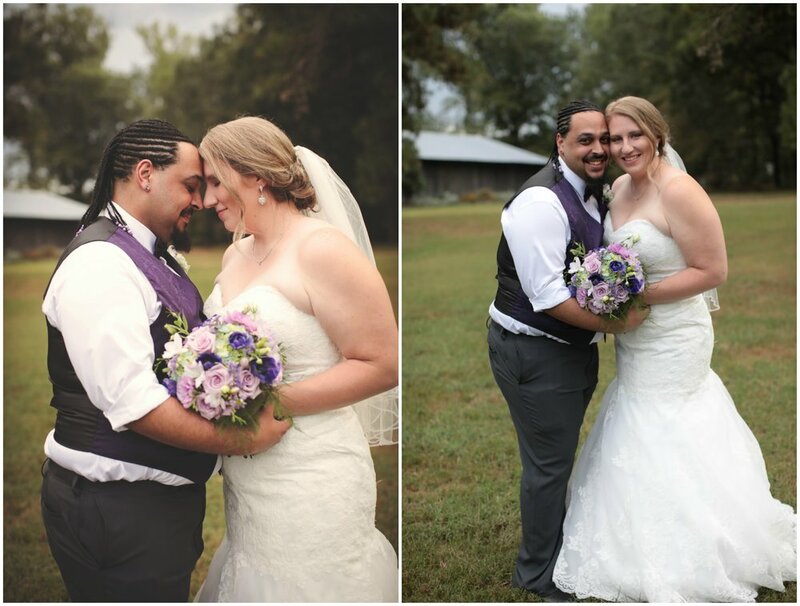 More than anything, Tasha wanted her wedding day to be "a representation of how far we have come, the love we share, and the beginning of the next chapter of our lives." "Our wedding day was a long time coming," she said. "We had been together for 8 years and have a 3 year old named Gavin... 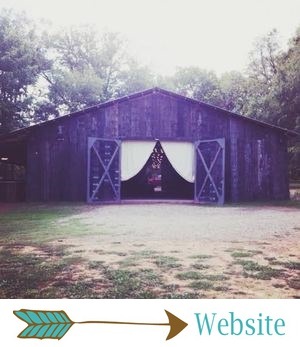 The Barn went above and beyond and made our wedding day a day we will cherish forever!" We love a bride who chooses details that make their wedding day totally their own. Tasha's bouquet was one of those unique, unforgettable details! The colors were stunning! 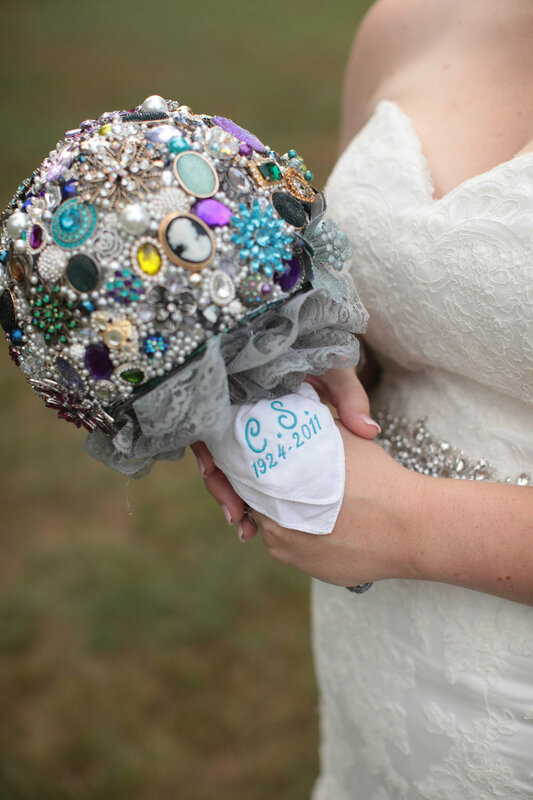 "I have always loved brooch bouquets and knew I had to have one for my big day," she said. "It took forever to make but I love the way it turned out. The bridesmaids' bouquets turned out beautifully. 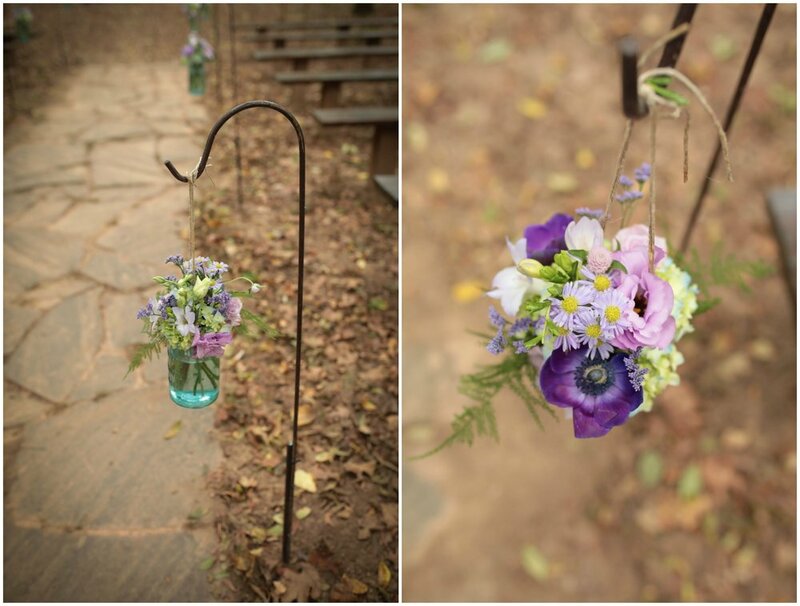 The colors were beautiful and went well with my bouquet!" Tasha's dress was from David's Bridal, and it was SO pretty. Forever in love with a strapless gown with subtle lace details, a little bit of sparkle, and a super flattering, fit-and-flare silhouette. What a gorgeous bride this lady was! The bridesmaids wore elegant, BEAUTIFUL floor-length gray dresses, which were also from David's Bridal. I love these dresses... They're timeless and so flattering! The guys looked classic and handsome in dark gray pants, white shirts, purple vests and bow ties. This bridal party will never go out of style! 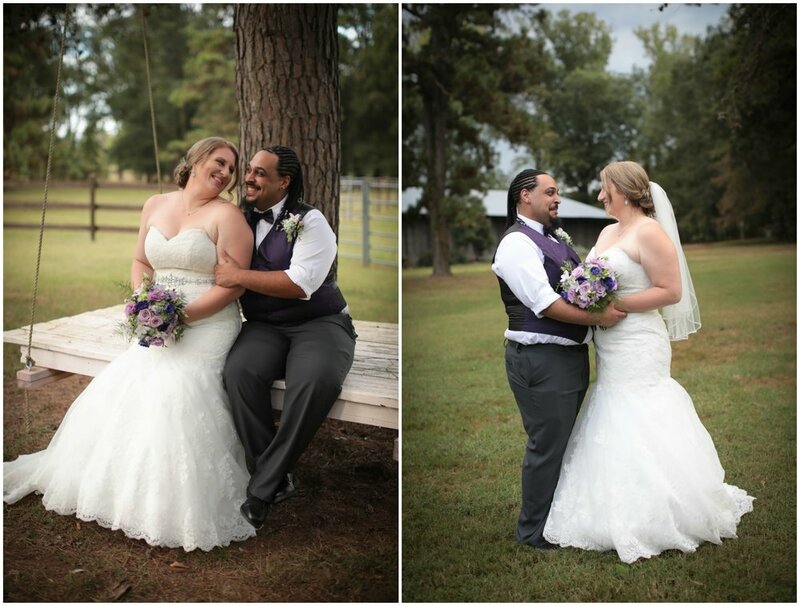 All first looks are precious, but this one was extra sweet. Tasha and CJ have an adorable son, Gavin. He was included in his parents' first look, and the level of excitement is almost palpable in these photos. This family is the best, and we couldn't be happier for them! 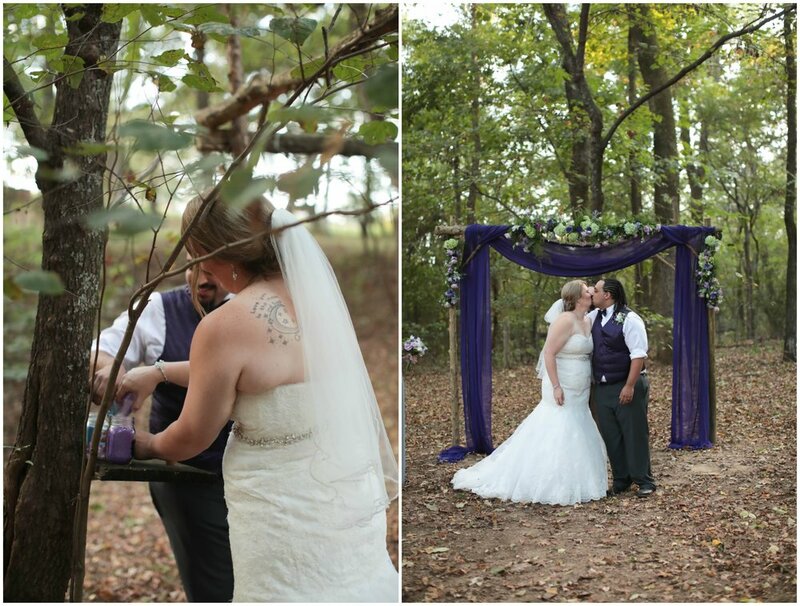 Tasha and CJ's ceremony was full of gorgeous purple details! 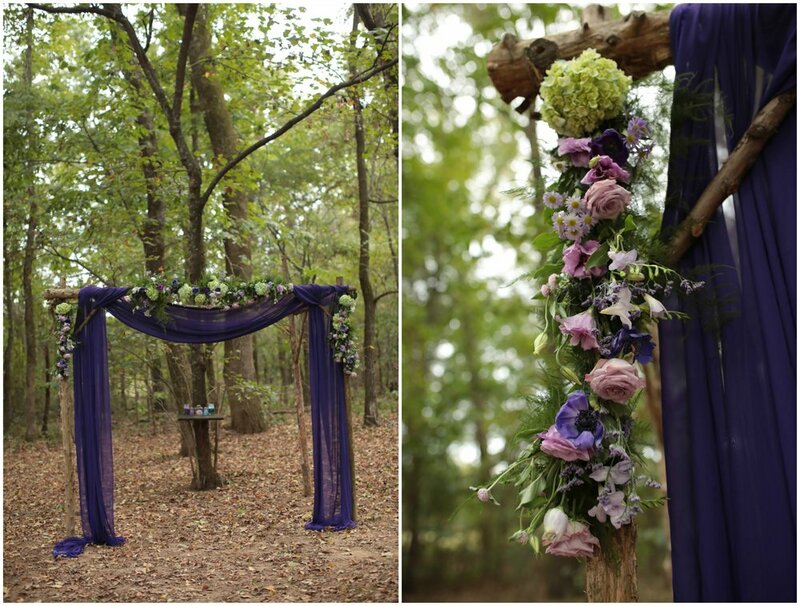 Their altar included a stunning purple drape and purple and green florals. It was so lovely against the fall background! Their aisle was super simple, with mason jars full of flowers. They had a fun Jenga guestbook for their gusts to sign, and they also had some really fun ceremony music! Tasha walked down the aisle to Tom Petty's Free Fallin'. 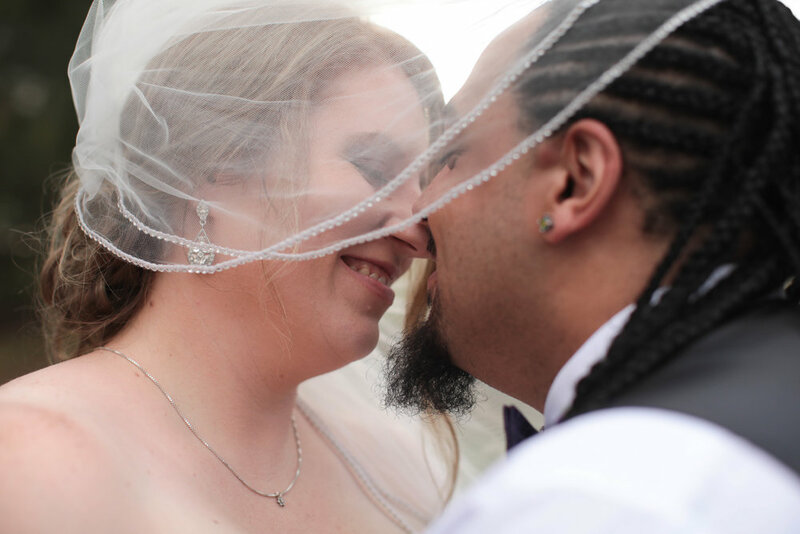 One moment of her big day that Tasha will never forget: "Our exchanging of vows," she said. Their ceremony was perfect. As Tasha said, this day was a LONG time coming. After eight years together, she and CJ were so ready to say their I do's and begin the next chapter of their lives together! How cute are these happy, newly-married faces! 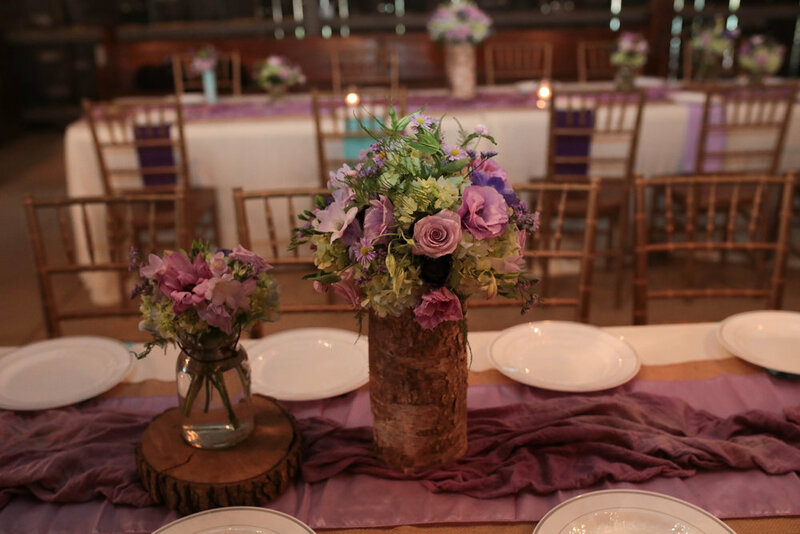 The details of Tasha and CJ's ceremony were rustic-chic, with ivory tablecloths, burlap runners and the prettiest purple runners, wood details, and mismatched vases holding purple and green florals. Their place settings included napkins in shades of purple and blue, which gave such a fun pop of color to their tables! Some of the most fun, unique details of their reception were their two AMAZING cakes. "The grooms cake was a Batman cake because HELLO BATMAN!" Tasha said. "We are big superhero fans in this family! Our wedding cake was a galaxy cake! It turned out awesome!" Tasha and CJ wanted their wedding to be a super fun party, so a great playlist was at the top of their priorities! "We wanted our day to be a celebration with our friends and family that we would never be able to forget," Tasha said. "We took our time making our music playlist for the reception. We wanted everybody on their feet dancing and having a great time. We played a variety of songs from artists like Salt N Pepper, The Backstreet Boys, Prince, ACDC, P!nk, Drake, Micheal Jackson, and Beyonce! We had a blast and danced all night long!" Their reception was such a fun dance party, and Tasha said two of her most unforgettable memories from the day were "the father daughter dance, and the awesome dance moves of my son, Gavin, and his cousin Aidan," she said. "Those kids can dance!" Umm, we want to be friends with these guys! Tasha and CJ sent their guests home with some really cute koozies in their wedding colors. Tasha and CJ are seriously awesome, so obviously their grand exit wasn't any boring ol' getaway! Their guests waved glow sticks as they left The Barn, and it was the perfect ending to such a fun night! They didn't go on a honeymoon just yet, but they plan to for their first anniversary.